This is my painting routine: support is usually mountboard primed with Art Spectrum (available in about six colours) or gesso. The former is expensive so I use white gesso tinted with a very small amount of cadmium red and burnt sienna acrylic paint to create a light pink colour. I apply two coats in opposite diagonals and when dry lightly sand if necessary - this provides a good tooth for pastel. The next step is to draw the main features of the picture with conté or similar pastel and to apply much diluted washes in watercolour to establish the main colours and which allow the pink ground to show through. 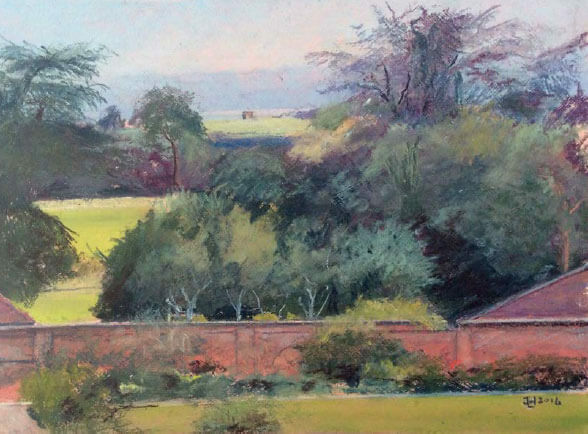 When dry, I use soft pastel such as Unison over the whole picture to establish colour and tone and this is made easier by the underlying watercolour. Harder pastels and pastel pencils are used for details. I try to ensure that initial layers of pastel are quite light by rubbing if necessary so that the pink primer continues to show, in fact there are areas where this is obvious. In nature this is apparent in distant horizons especially. 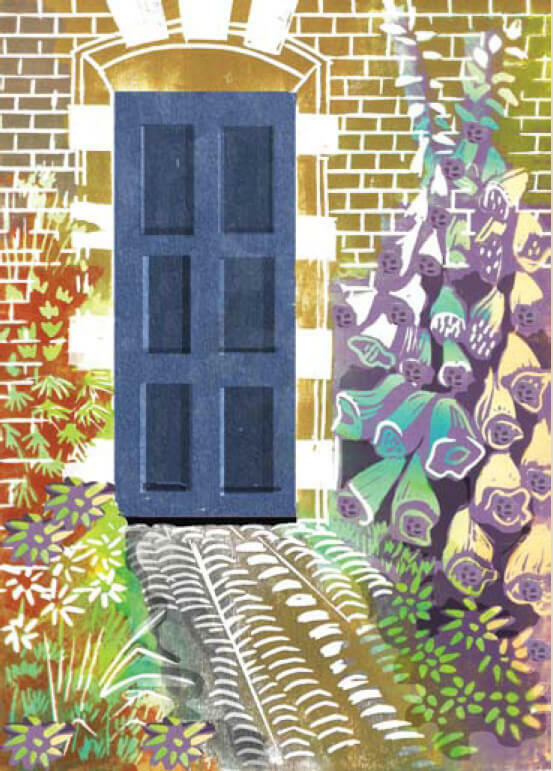 The Blue Door leads into the herbaceous border which is a key feature of the Walled Garden at Croome. This linocut was based on a photograph taken in summertime and reflects the vivid colours of the perennial	flowers in bloom at that time of the year. Due to the nature of linocutting, each of the ten images produced varies in colour and texture. At a recent Elmley Art Group meeting, I attempted the ‘bleached ink’ technique. We realised quickly that the discipline brings no guarantees in terms of the outcome! Various strength dilutions of inks were used including Quink, which brought back memories of school, with inky fingers and blotched exercise books. The method: a wash of ink is applied and allowed to dry. A solution of bleach at a ratio of 4:1 water to bleach, is then used to	remove colour from the paper to create the desired image, using perhaps a synthetic brush, cotton bud, bamboo pen or ordinary pen. It is possible to re-apply ink and wash it	out again if necessary. 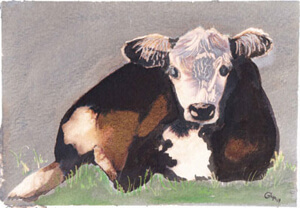 Having failed badly at first, ‘The Calf’ was my second attempt. No longer 'in progress', finally finished yesterday. 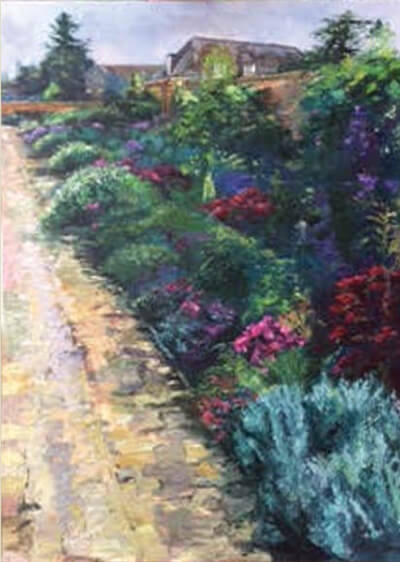 It was a dull, flat, oil painting in its initial stages, then transformed by	watching an instructional YouTube video on 'the use of a palette knife'. The colours were brightened a little and I drew inspiration from my own garden borders.